We have a zero-tolerance approach towards discriminatory language and behaviour. We actively promote equality and celebrate diversity as demonstrated through our work towards achieving the Premier League Equality Standard, and our support of a range of campaigns including: Level Playing Field; Rainbow Laces; Football vs Homophobia; Kick it Out, and our own ‘One Club and One Community Against Hate Crime’ Campaign. Huddersfield Town Football Club plays an integral role within the local community. We are proud of our reputation of creating and developing community cohesion throughout the town and the wider locality. Football itself plays a unique role in bringing people together from a wide range of different communities, and can provide opportunities for all sections of the community to engage with the Club and participate in the community programmes provided by our charity, Huddersfield Town Foundation. We wholeheartedly advocate that everyone, regardless of background and any protected characteristic is welcome at the Club, and we expect all stakeholders to behave towards others in a manner consistent with the principles of respect, tolerance and fairness. – Can be assured of an environment in which their rights, dignity and individual worth are respected, and in particular that they are able to enjoy their engagement at the Club without the threat of discrimination, intimidation, victimisation, harassment, bullying and abuse. Huddersfield Town AFC has a zero-tolerance policy towards discrimination, intimidation, victimisation, harassment, bullying and abuse, and we are committed to ensuring that any such allegations are reported and addressed in accordance with the Club’s procedures. This policy reflects our commitment to meeting the requirements of the Premier League Equality Standards and the Equality Act 2010. The Club fulfils the statutory requirements of the Equality Act 2010 in relation to different protected characteristics. We work hard to ensure that our staff and supporters demonstrate expected standards of behaviour, which are based on the principle of respect for others, and which relate to our zero-tolerance approach to all forms of inappropriate and/or illegal conduct. Racial, homophobic/transphobic, sexist, ageist or other discriminatory language or behaviour is strictly forbidden and any match-day fan who conducts themselves in a manner that contravenes expected standards of behaviour will be subject to arrest and/or ejection from the Ground. The Club reserves the right to impose any other sanctions as appropriate/necessary in relation to the conduct of match-day fans, which may include a ban for one or more matches. Any employee of Huddersfield Town AFC found to be in breach of acceptable standards of conduct in relation to non-discriminatory practice and/or use of language will be subject to the Club’s disciplinary procedures and action will be taken as appropriate following investigation and in accordance with those procedures. As well as complying with legislation, Huddersfield Town AFC will promote equality by taking positive steps to counteract the effects of physical or cultural barriers, whether real or perceived, that restrict the opportunity for all sections of the community to participate equally and fully. Huddersfield Town AFC will therefore seek to institute, support or contribute to appropriate measures or initiatives that enable access to our club, as well as require participation in associated activities by people from any group that is under-represented in the Club or has difficulty accessing it. – A copy of this document will be accessible from the Club Charter, within the Club’s website. – Huddersfield Town AFC’s Board will take overall accountability for ensuring that the policy is observed by all. – The Board will take full account of the policy in arriving at all decisions in relation to activities of Huddersfield Town AFC, so as not to discriminate against and/or exclude any individual or group. – Huddersfield Town AFC will implement regular audits, surveys and/or other initiatives designed to assess the level of participation of different sections of the community in the Club and will take account of the findings in developing measures to promote and enhance equality, and celebrate diversity, in the Club. – Huddersfield Town AFC will provide access to a rolling programme of training (for example, online, face-to-face, briefings) for all of its players, match-day fans, staff, Board members, participants in outreach programmes and other people engaged with the club’s activities to raise awareness of both collective and individual responsibilities in relation to complying with the Equality Act 2010 and eliminating all forms of discrimination and other form of unacceptable conduct. – Support such measures and initiatives that Huddersfield Town AFC may institute or take part in to advance the aims of this policy. 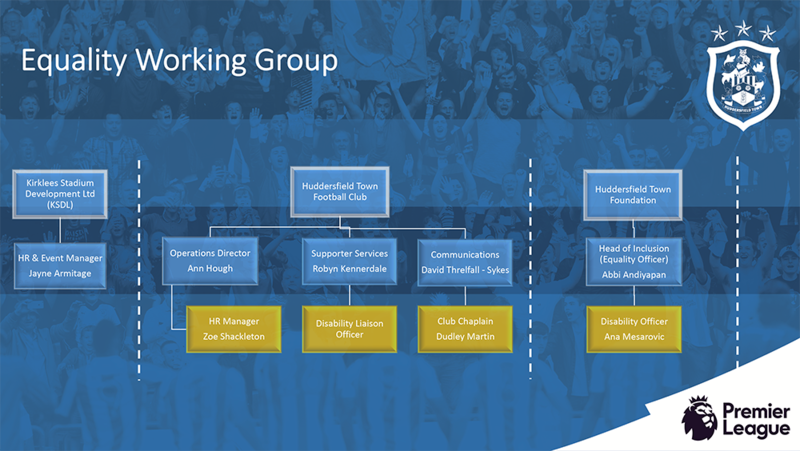 To ensure compliance with this policy Huddersfield Town AFC will ensure that in the development of partnership and/or service level agreements with suppliers or other external partners, equality and diversity considerations are incorporated into the terms of engagement. – The Board will be accountable for ensuring the implementation of this policy. The CEO and Board will be responsible for the day-to-day implementation of equality in the club. – All employees and/or other stakeholders in Huddersfield Town AFC will be required to adhere to this policy at all times. – The CEO and Board will review all of Huddersfield Town AFC’s activities and initiatives against the aims of the policy and will report formally to the Board on any identified issues at least annually. – The CEO and Board will review any measures or initiatives that Huddersfield Town AFC may institute or take part in to promote and enhance equality and celebrate diversity in the Club, and will report their findings annually to the Board. – The Board itself will review the policy at intervals of no more than three years, (or when necessary due to changes in legislation) in line with Huddersfield Town AFC’s policy review process. Huddersfield Town AFC considers all of the forms of discriminatory behaviour, including (but not limited to) racial, homophobic/transphobic, sexist, ageist or other discriminatory language or behaviour, as unacceptable, and is concerned with ensuring individuals feel able to raise any legitimate grievance or complaint related to such language and/or behaviour without fear of being penalised for doing so. – Appropriate disciplinary action will be taken against any player, match-day fan, staff, Board member, participant in outreach programmes and other people engaged with the club’s activities who violate Huddersfield Town AFC’s Equality Policy. – Any person who believes they have been treated in a way that they consider to be in breach of this policy by a player, match-day fan, member of staff, Board member, participant in outreach programmes and/or other people engaged with the Club’s activities should, in the first instance, complain directly to the person responsible if they feel able to do so. Alternatively, a complaint may be made to any member of staff who will ensure the appropriate line manager is notified and that all necessary enquiries and action to resolve the issues can be taken. If this initial intervention does not resolve the matter, or in the case of allegations of discriminatory behaviour against Huddersfield Town AFC itself, the person may raise the matter by writing directly to Ann Hough, Operations Director, by email to ann.hough@htafc.com. – Huddersfield Town AFC will nominate an appropriate member of staff to investigate any complaint that may be received. The investigation will be conducted impartially, confidentially, and without avoidable delay. Any person against whom a complaint has been made will be informed of the allegation(s) and given the opportunity to present their side of the matter. The parties in question will be notified of the outcome of the investigation, in writing, and reported to Huddersfield Town AFC’s Board. If the investigation reveals unacceptable, discriminatory behaviour on the part of a person or organisation Huddersfield Town AFC may impose sanctions on that person or organisation in line with its policies. Sanctions may range from a verbal reprimand, a written notice concerning future conduct, and/or temporary or permanent exclusion from Huddersfield Town AFC’s grounds and associated activities. In deciding what sanction is appropriate in a particular case the Board will consider the severity of the matter and take into account any mitigating circumstances. Where the violation of the Equality Policy by way of harassment, victimisation or discrimination amounts to a criminal offence, the appropriate authority will be informed. In the event that an individual or organisation associated with Huddersfield Town AFC is subject to allegations of unlawful discrimination in a court or tribunal, the Club’s Board will cooperate fully with any investigation carried out by the relevant lawful authorities and, subject to the outcome, may consider taking action as above in relation to the matter concerned. Adopted by Huddersfield Town AFC Board. Diversity Champions are members of staff that operate at all levels within both Huddersfield Town and Kirklees Stadium Development Ltd.
Our Diversity Champions support Huddersfield Town AFC in promoting and embedding equality, diversity and inclusion (EDI) in all aspects of our work at the Club and Stadium, they also act as a point of contact for people to discuss equality and diversity if they wish. The Diversity Champions are identifiable by their Diversity Badge (below). Should you want more information about who our Diversity Champions are, or the role itself then please contact the Club directly.